Bicyclists, walkers, and roller bladers can go from Harbor Springs to Charlevoix on the 26-mile long Little Traverse Wheelway. The segment between Bayfront Park in Petoskey to Petoskey State Park follows closely the path of the original Little Traverse Wheelway which stretched from Petoskey to Harbor Springs in the 1880s and 90s. 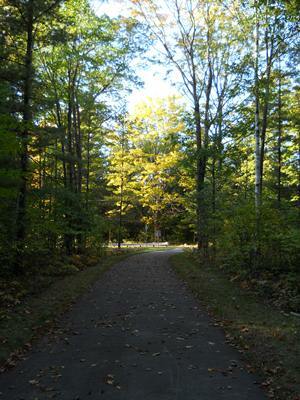 Biking in Northern Michigan on the Wheelway is spectacular. A "gate" over the trail at the east end of Bayfront Park replicates the original gate that stood at nearly the same spot. All trail uses are encouraged with the exception of snowmobiles and horses. Listed here are Little Traverse Wheelway trail segments beginning in Charlevoix. Division/McSauba Roads Intersection via Waller Road -- This two-mile in-city segment begins at the intersection of Division and McSauba roads on Charlevoix's north side and is a "designated" trail shared with automobiles. US 31 at Waller Road to West Park near Bay Harbor -- This trail has 7 miles of asphalt and .6 miles of boardwalk through a wetland. West Park to East Park near Bay Harbor -- Here you'll find 5.5 miles of asphalt near US 31. There are some panoramic views of Lake Michigan and the Village of Bay Harbor (business district). East Park near Bay Harbor to Magnus Park in Petoskey -- This is the "Resort Bluff" segment that currently runs 1.2 miles and winds past Northern Michigan Regional Hospital and down the bluff to Magnus Park. Magnus Park to Little Traverse History Museum -- This .8 mile segment is a "designated" bike route along Lake Street. The North Country Trail joins the Wheelway at the Bear River. Little Traverse History Museum to West End of Bay View -- This 1.25 mile segment runs through Bayfront Park and utilizes a short stretch of sidewalk before reaching Bay View. West End of Bay View to East End of Bay View -- The .75 mile trail follows the salmon-colored sidewalk through Bay View to Division Road, then turns north to connect with the East Bay View segment. East End of Bay View to M-119 at the Litzenberger Fountain -- A 1.4 mile segment that runs through a young oak and white pine forest to M-119. The "back entrance" to Petoskey State Park with its sweeping dunes and fine swimming beach is located just east of the Tannery Creek Condominiums. Litzenberger Fountain to Beach Road -- This 1.4 segment tracks along a largely commercial area along M-119 and past the main entrance to Petoskey State Park to Beach Road. Beach Road to the Little Traverse Township Park at Pleasantview Road -- This 1.1 mile segment runs close to M-119 before cutting away to follow the northeast edge of the Harbor Springs airport. Township Park to Harbor Springs -- This nearly 3.5 mile includes a small boardwalk section along the Wequetonsing Golf Club as it heads into Harbor Springs. The trail ends in Harbor Springs on Lake Street where cyclists can continue along the sidewalk to the new Hoyt Road trail and head north to Cross Village or turn right on the new bike path at Kosequat park and continue into downtown Harbor Springs.